We have received your entry and will contact you with any questions. Good luck! Win up to $10,000 of DesignRail® Aluminum Railing from Feeney! Are you planning to install or replace a deck or balcony railing this year? 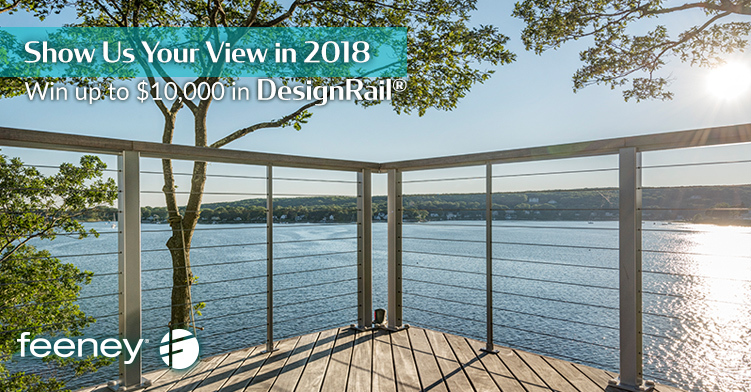 If so, send us photos that show us the view from where you'll be installing your new railing and you could win up to $10,000 off your order of Feeney DesignRail® aluminum railing. Plus, everyone who enters receives a 10% manufacturer's rebate off a DesignRail® order just for entering. Restrictions apply, so please read the complete contest rules before submitting your entry. If you have any questions, please give us a call at 1-800-888-2418 or email ShowUsYourView@feeneyinc.com. Snap some high-resolution digital photos showing the view from where your new railing would be installed. You don't need to show any existing railing in the photo, just the view as if you were standing at the new railing gazing out at the landscapes or cityscapes beyond. Please do not include people in the photos. Complete the online entry form, attach your photos, and you're good to go! Or, if you'd prefer to mail or email your entry, simply print, complete and submit the mail-in entry form. Entries must be received by midnight, June 30, 2018 to be eligible. Winner will be notified by July 11, 2018. Once we receive your entry packet, we'll review it to make sure it's complete and contact you within 5 days to confirm receipt. Please call or email us if you don't receive a timely confirmation or if you have questions: 1-800-888-2418 or ShowUsYourView@feeneyinc.com. The winning order and all rebate orders must be placed with a Feeney Authorized Dealer between July 11, 2018 and March 31, 2019. Legal residents of the United States who are at least 21 years of age. Entrants must either own or have the authority to make renovations to the property represented in the submitted photos, on which the railing prize will be installed. The property must be located within the 50 (fifty) United States or the District of Columbia. Employees of Feeney, Inc. (Feeney), subsidiaries, affiliates, dealers, sales reps, advertising and promotion agencies and the immediate family members of each are not eligible. No purchase is necessary to enter the contest. A completed entry form along with up to 4 photos of the view from where your new railing would be installed. Photos must be taken from the jobsite where the winning railings would be installed. You don't need to show your current railing (if applicable) in the photo, just the view as if you were standing at the new railing looking out at the landscapes or cityscapes beyond. Please do not include people in the photos. Cropped photographs are eligible, but those that have been digitally or otherwise enhanced or altered are not. Please shoot the photographs in the highest resolution possible. Complete and submit the Show Us Your View entry form and attach up to 4 digital photographs. Or, submit an entry by mail or email by downloading, printing, and completing a copy of the entry form from the website, www.feeneyinc.com/SUYV, and mailing it with photos to Show Us Your View Contest, 2603 Union Street, Oakland CA 94607 or email to ShowUsYourView@feeneyinc.com. Entries must be received by midnight June 30, 2018. Up to $10,000 (USD) will be applied as a payment against a single order for Feeney DesignRail® aluminum railing products. The winner may select from any of the standard styles, colors, and infill types offered in the Feeney DesignRail® product line. The value of all materials will be based on Feeney's standard list prices. Installation services and labor are not included. Should the single order (materials, shipping and sales tax) exceed the maximum $10,000 prize amount, the winner will be responsible for the difference, and if the order is less than $10,000, the prize will be equal to the amount of the order. The railings must be installed at the jobsite indicated in the entry form. The prize has no cash value. Judging will be conducted by a panel of Feeney employees. The judging panel's decision is final. There will be only one winner for this contest. The contest winner will be notified by phone or email by July 11, 2018. The winner may be asked to execute an Affidavit of Eligibility/Originality and Publicity/Liability Release. All required documentation must be returned within 10 days from the date of notification or the prize will be forfeited. The winner must select a Feeney Authorized Dealer to place their order (see Dealer Locator on website to find a dealer near you). The dealer will work with the winner to determine the DesignRail® products needed for the project and then create a single order that includes the products, sales tax and shipping. All DesignRail® product prices will be based on Feeney's standard list pricing. Feeney will then pay the dealer up to $10,000. (see Prize section above) which will be applied directly to the order. Feeney will ship the order to the jobsite address noted on the application form. The winner must place the order by March 31, 2019 or the prize will be forfeited. Winners may be posted on the appropriate Feeney, Inc. web site and/or social media pages. Winners will also be responsible for paying any taxes they may owe on a prize. Prizes are non-transferable. In the event of non-compliance with these requirements, the prize will be forfeited and the entry with the next highest score will be declared the winner. Feeney reserves the right to disqualify entrants and/or cancel or suspend the Contest should unauthorized intervention or other causes corrupt the administration, security, fairness, integrity or proper operation of the Contest. All entrants of the 2018 Show Us Your View contest, except the contest winner, are eligible for the one-time 10% rebate. The rebate can only be used on a single order of Feeney DesignRail® aluminum railing products purchased at a Feeney Authorized Dealer between July 11, 2018 and March 31, 2019. The rebate is calculated on the price of the Feeney DesignRail® products only, excluding any sales tax, services, handling, or shipping. The order must be placed by the person noted on the contest entry form; the rebate offer is non-transferable. To receive the rebate, send a copy of the purchase receipt along with your contact information to Show Us Your View Rebates, 2603 Union Street, Oakland CA 94607 by April 30, 2019. Receipt and contact information may also be emailed to ShowUsYourView@feeneyinc.com. Receipt must clearly identify the Feeney DesignRail® products, pricing, and authorized dealer name. Feeney is not responsible for any submissions lost, damaged, or delayed in transit; please retain copies of any submitted materials. After review and approval, Feeney will issue a check to the individual noted on the entry form; rebate checks will only be mailed within the 50 (fifty) United States and the District of Columbia. Product cannot be returned for refund once the rebate has been issued. An entrant must hold all rights to a photograph. Submission of an entry grants Feeney and its affiliated companies the unrestricted right to modify, edit, adapt, alter, publish and/or use the submitted photograph in any way, at any time and in any and all media in connection with the advertising or promotion of Feeney's products or services, without consideration or payment to the entrant or to any other third party. At its discretion, Feeney also reserves the right to include the name of the entrant as well as the city and state in which the photo was taken in any and all such above described advertising and promotional activities. The entrant is solely responsible for obtaining necessary authorizations from owners of all private property and trademarks appearing in the photograph and to grant Feeney the rights herein granted. Entrant further represents that the photo does not infringe or violate any third-party rights. By sending your submission and entering the Contest, you certify that you have read all of the Official Contest Rules and accept and agree to be bound by these rules and the decisions of Feeney, which shall be final, binding, and conclusive on all matters. You also agree that if you win, Feeney has the right to create case studies and other promotional materials, including but not limited to, before and after stories, photographs, videos, etc., related to your construction with and use of the prize materials. All entries and photographs become the exclusive property of Feeney and will not be returned or acknowledged. Feeney will not be responsible for lost, delayed, damaged, misdirected or illegible submissions or any computer, telephone, cable, network, electronic or internet hardware or software malfunctions, failures or unavailability. The contest is void where prohibited, taxed or otherwise restricted by law. Feeney reserves the right to terminate or suspend the contest or to alter or amend the contest rules without notice, at any time and for any reason. If you have any questions, please give us a call at 1-800-888-2418 or email ShowUsYourView@feeneyinc.com.